West Ham boss Slaven Bilic has revealed striker Diafra Sakho could be out for at least two months with a thigh injury. The Senegal international suffered the problem as he attempted to shoot during the second half of last Sunday's 1-1 draw with West Brom. The Hammers are still awaiting the results of a scan to determine the full extent of the injury. But Bilic said: "It's not good. It will be four to eight weeks. Maybe more. "He has a bit of history with his thigh. It's a muscle injury. Nothing long term, but we will be without him for a few games, definitely." 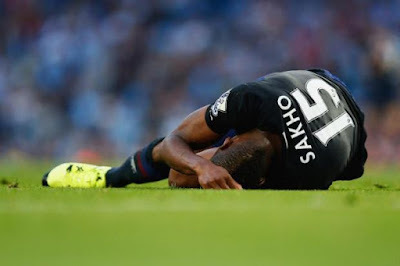 The injury to Sakho, who has hit five goals this season, is the latest blow to hit Bilic's attacking players after Dimitri Payet and Enner Valencia were sidelined by ankle problems. Andy Carroll, only recently back to fitness after six months out following ankle surgery, is set to lead the line against Manchester United on Saturday.